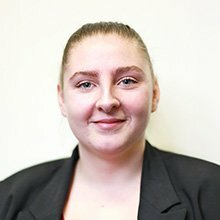 Louise came straight from college & started as a Trainee Receptionist with Central Employment over 10 years ago. She has since progressed within Central Employment and is now the company’s Compliance Officer. With a strong personality & excellent proficient ability Louise not only keeps the busy reception area running smoothly but also keeps the consultants in check! As the company compliance officer Louise also holds the important responsibility of keeping the company compliant and water tight, a responsibility she takes very seriously. Louise loves the Lake District, enjoying the beautiful walks. A tough no nonsense girl who enjoys football, Boxing & UFC, says it all….